Good luck, I can wait for the next additions. 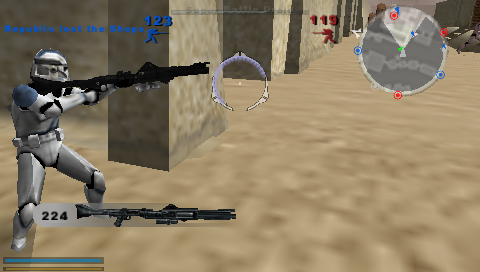 About new weapons; Originally I had planned to have a fake console function that would switch the weapon loadouts, this didn't work well because the weak PSP engine doesn't like loading things mid-game. - (This idea is even unstable on PC platform from my experience) - So I decided to replace default weapons completely and have them loaded automatically each match. Most new weapons will perform pretty much the same as default weapons, I'm just upgrading cosmetics such as models, textures, and laser effects. Award weapons will continue to use default weapon models. Not all levels will feature the upgraded weapons, this is because in some maps, the graphics memory is already reaching the limit of 2MB. Loading the new weapons tips it over the edge cause the game to crash. 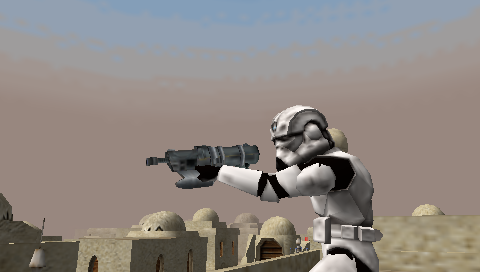 So far we've got the underhand chaingun for the clone commander, DC pistols for clone soldier/sniper/vanguard/commander. 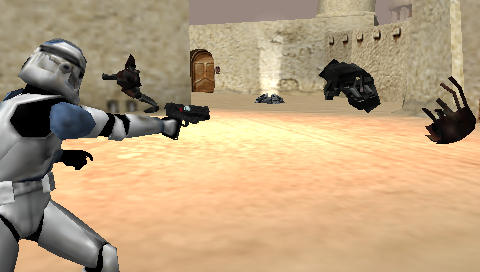 We have DC blast cannon for the engineer and the DC-15A rifle for the soldier class. All primary factions such as rebels, empire, and cis will be getting new weapons as well, I just did clones first because clones are pretty much the only thing people care about in SWBF2. Most new weapon assets are coming from the BFX 2.2 mod from the PC platform. So after playing version 6 for a while, (which I really love by the way ) I recorded the campaign maps that do work and the ones that don't work. 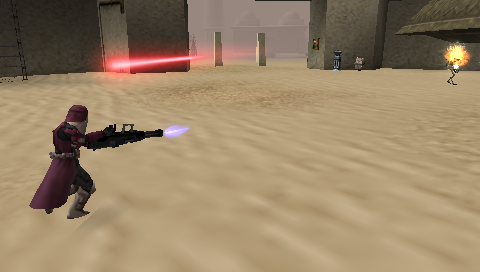 Coruscant: Jedi Temple- It crashes when you get to the objective to "kill 3 Jedi Masters". Specifically, when you actually start to attack them, it crashes. Death Star: Interior- Works Perfectly! Even has a "Victory" screen when you complete the campaign mission. Felucia: Marshland- The majority of the campaign works just fine. When you get to the last objective, which is to "Destroy the CIS Defense Turrets at the Fungal Tree", it automatically/immediately goes to the "Victory" screen. Geonosis: Freight Dock- Does not work. 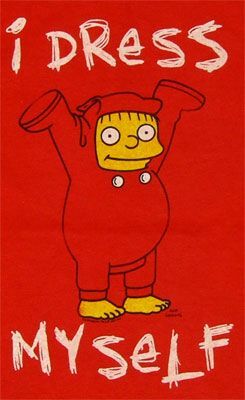 Doesn't have any objectives. Hoth: Echo Base- After you capture the Echo Base hanger, the game will freeze. You can still hear game music after it freezes though. Kamino: Cloning Facility- Most of the campaign works. When you get to the last objective, which is to destroy 2 Gunships, even after you destroy both of them, it doesn't say that you completed the objective. Kashyyyk: Beachhead- Campaign works perfectly, but doesn't have a "Victory" screen when the campaign is finished. Mustafar: Refinery- Campaign works just fine, but no "Victory" screen. Mygeeto: War-Torn City- The game crashes while loading. Naboo: Theed- The game crashes while loading. Polis Massa: Asteroid Base- Campaign works just fine. No "Victory" screen. Space Coruscant- Crashes while loading. Space Kashyyyk- Campaign works. No "Victory" screen. Space Mustafar- Crashes while loading. Space Yavin- Campaign works. No "Victory" screen. Tantive IV: Interior- When you get to the last objective, which is to capture Princess Leia, she doesn't spawn anywhere on the map, thus not being ale to complete the mission. Utapau: Sinkhole- Campaign works. No "Victory" screen. Yavin 4: Temple- Campaign works. No "Victory" screen. Thanks, that saves me the play time. There is no campaign for the freight dock map, you probably meant the regular Geonosis map. Mygeeto - I know what causes the crash, I fixed it but the level still crashes randomly during gameplay on my end. Felucia - No idea why it skips the last objective, which I did know about already. Hoth - I have a general idea on why it freezes but plays sounds. AirRaid101 wrote: Tantive IV: Interior- When you get to the last objective, which is to capture Princess Leia, she doesn't spawn anywhere on the map, thus not being ale to complete the mission. This is even a problem on the PC version, though I have no idea how it can be fixed. I'm just going to add Leia as a regular class for rebels on Tantive campaign. That way she'll be on the level at all times. 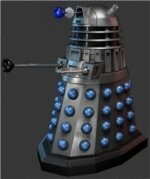 EDIT: The version six of the PSP mods currently available already has unlimited user script support, I just forgot to speak about it previously. For those who don't know what this is - it's a function that allows people to inject their own code into the game by adding a small file that the game scans every match. Obviously this is a thing for people who already understand SWBF2 mod tools and Lua so don't get all excited about it if you're just the average player. I've made a user script file that automatically turns off the glowing award effects on your body. Just put the file user_script_11.lvl from the download inside the game folder _lvl_psp. Remove the file to turn turn award effects back on. I may create a few more user scripts for other things later on. I have been brain storming and I think I can fix fake console while playing the campaign. At the time, fake console does not work in campaign levels because the campaigns already load a ton of code and the fake console has it's own huge amount of code. What I am thinking is, I can break off a huge chunk of the fake console and build it into a user script file. This way I can keep fake console small and functional (important things only) and the players can choose when they want to extend the full menu by adding in the user script file. The per-map commands and the skin changer commands would certainly be extended to an external file. I am still thinking which fake console menu items are most important to have without adding the external file. Anthony, I just have to say I admire your dedication. I know firsthand that modding anywhere but PC can be much tougher, and you've really pushed the PSP beyond its limits. Teancum wrote: Anthony, I just have to say I admire your dedication. I know firsthand that modding anywhere but PC can be much tougher, and you've really pushed the PSP beyond its limits. Thanks, that means a lot. I still have tons of stuff planned, new ideas just keep coming. I could have been done by now. Earlier in this thread I mentioned how I tweaked the probability of each droppable item when a character dies. There is 7 items total and I gave each one a 0.14% drop chance, leaving a 0.2% chance a dead body drops nothing. I am thinking I can create custom power up items that look like weapons, and tagging that powerup would instantly change the character's primary weapon to whatever weapon represented by the powerup. The actual power up wouldn't give the player any abilities like health or ammo, it'd just be an item that looks like the gun you'd get for picking it up. I'd use this to fill in the 0.2% left over drop rate that isn't used, so dropping a gun would be rarer, making it more cool. EDIT: I am pulling SWBF1 Mos Eisley, mainly because it's the same as the SWBF2 map, with only the terrain changed. I am also pulling Naboo Outpost map, it keeps breaking and I don't know why and I do not want to keep fixing it. Which Kashyyyk? If you're referring to the stock SWBF2 PSP version, I know and I'll fix that later. Anthony, are you still planning to do the Vita version? Lordawesome23 wrote: Anthony, are you still planning to do the Vita version? Depends on when someone with a Vita is ready to do testing. Alright, when I get mine, I'll be sure to test it for you. By the way, with your PSP did you ever play WipEout Pulse? Did you see the light blooms? Could the PSP Zero Engine handle light blooms? Lordawesome23 wrote: Alright, when I get mine, I'll be sure to test it for you. No, I don't play many games on the PSP. Just the two famous GTA games and SWBF2. And I really don't know what a light bloom is or care to to learn. The PSP version of SWBF2 isn't supposed to be pretty, that's why I am trying to cram as much content as possible to make the replay value increase. Edit: Today I found a person who will sell me the Darth Vader PSP model with a crap load of accessories. -Well I got the Darth Vader PSP but it's packed with dirt and the UMD isn't working well. Not sure if I will keep it. Edit 2: I am pulling Bespin Canyons because I just can't improve performance to a playable state. Edit 4: I tried to get the campaign menus in the single player menu, it did not work. Save and load functions didn't work properly. So the only option that we'll ever have is doing campaigns one at a time from the instant action menu. Edit 5: I got the "campaign list" to show up in the galactic conquest menu.